The operator of the Ricoh Arena has threatened legal action over Coventry City's plans to play home games in Northampton from this season. 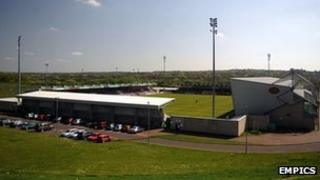 The Sky Blues announced they will play home games at Northampton Town's Sixfields Stadium for three years. Arena Coventry Ltd (ACL) said it had a pre-existing contract in place with Coventry to host matches and issued a notice of intent to Northampton Town. The Cobblers said the threatened action was "without any legal merit". Coventry City, who have been in administration since March, plan to stage home matches 34 miles away while they look at options for a building a new stadium. A spokesman for ACL, which is in dispute with the League One club over rent, said if Northampton allow the matches to take place, Coventry will be in breach of a contract. Ricoh chiefs would then seek to recover costs from the Cobblers, he added. The club said in a statement: "Northampton Town Football Club confirms that Arena Coventry Limited (ACL) has threatened the club with legal action in respect of Coventry City FC playing at Sixfields Stadium. "The club was approached by Coventry City to play at Sixfields, so that the club could fulfil its fixtures. The Football League has endorsed this arrangement. "The threatened action by ACL is without any legal merit and is not conducive to the greater good of the game. "Northampton Town Football Club will not be bullied or threatened." Nobody from Coventry City was available for immediate comment. ACL said it is meeting with the Football League on Monday. A spokesman for the company said: "We are fully aware of the dismay of Sky Blues' supporters and of other interested parties, such as various MPs and the European Parliament, in relation to the recent statement of the Football League. "We will ensure that the Football League fully appreciates the strength of feeling of everybody that wants to keep the Sky Blues in Coventry." James Powell, from lawyers Walker Morris, who are representing the company, said: "The lease and licence agreement remain in force even though the club is in administration. "You would therefore anticipate that the club should be playing its home games at the Ricoh Arena as it is contractually obligated to do."